A couple people have written me with questions about scratchbuilding in HO scale. I vaguely remembered articles in Car Model magazine, so now I've gone back and looked them up. I'm not going to post whole scanned articles, but here are tantilizing pictures and a short review of each article or ad, and you can hunt for the magazines yourself (like on ebay) if you are really interested. I'm sure there are more HO scale scratchbuilding articles, so send me a note if you know of them. Corrections are welcomed, thanks in advance! Bob Kirchner's HO scale scratchbuilt lead sled, Car Model 11-71. 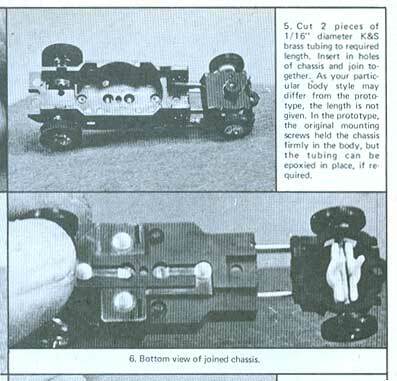 In Car Model magazine, November 1968, page 40-43, in a step-by-step, fully illustrated article, Carl Ladd creates "The Universal HO Chassis" in an article of the same name. He joins an HO scale Aurora T-Jet chassis to a TYCO steering system with brass tubing; busily hacking, chopping and soldering in the standard, time-honored scratchbuilding fashion. Car Model magazine, August 1969 has an article on page 34 titled, "HO Cars: The Whole Story, Part 4: Simple Sidewinder in HO" by long-time slot car writer Robert Schleicher. 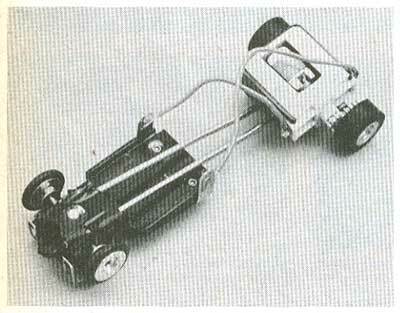 For this article, Schleicher creates a true sidewinder in HO scale, where the rear axle actually passes through the motor case - awesome! 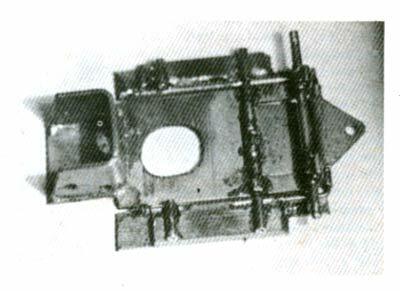 Two long brass tubes extend from the motor case and are epoxied into holes in a TYCO chassis front end, and voila! -he's done it again.